With Q4 in the books, investors are looking for direction following a sharp selloff that dragged the S&P 500 index down 13.52% to finish 2018 off -4.38%, representing its worst yearly return since 2008. The Dow Jones Industrial Average fell 11.31% in Q4, finishing the year down -3.47%, and the tech heavy Nasdaq index shed 17.29% in the quarter, finishing the year down -2.83%1. The Fed, the trade war, and President Trump’s Twitter feed all helped fuel uncertainty in the markets, leading to a spike in volatility. Concerns of peak corporate profits and a hawkish Fed outweighed the continued strength of consumers, who helped drive the strongest holiday shopping season in six years. A sharp selloff in oil prices, a 0.25% Fed funds interest rate hike, and a U.S. government shutdown helped cap off a tumultuous quarter that is likely to spill over into the New Year. As President Trump kicked off 2018 by imposing Tariffs across the board against both economic allies and adversaries, he aimed to end the year by striking a number of trade deals that would help boost the economy and sentiment. Fresh off the heels of striking a deal and averting an escalating trade war with Europe in July, Trump set his eyes on a revamped NAFTA trade deal with Canada and Mexico. The deal, named the United States-Mexico-Canada Agreement (USMCA), was agreed upon on September 30and signed by all three leaders at the G20 conference on November 302. The USMCA is currently awaiting passage by the respective governments of all three nations. The new deal will account for more than $1.2 trillion in trade between the three countries. The temporary boost in investor sentiment caused by the USMCA agreement was overshadowed by the escalating trade tensions between the U.S. and China. While no trade deal was reached between President Trump and Xi Jinping, the two countries did announce that they would postpone all pending tariffs until March 1, 2019, and work in good faith to reach a deal by then3. Interest rates fell sharply in Q4, with the 10-year yield falling from 3.24% at its peak in October to 2.66% by the end of the year. On December 19, despite political pressure from the Trump administration, the Federal Reserve went ahead with its fourth rate hike of the year, raising the federal funds rate to a target range of 2.25% - 2.50%. The central bank officials lowered their forecast for three rate hikes in 2019 down to two, and agreed that a “gradual” increase in interest rates remains appropriate4. Fed chairman Jerome Powell also reiterated that the gradual reduction of its balance sheet by $50 billion per month would remain “on autopilot.5” The FOMC now expects 2019 GDP growth of 2.3%, a 0.2% reduction from its prior forecast6. Confidence in Fed chairman Powell was tested in Q4 due to a consistent barrage of tweets from President Trump urging him to stop raising interest rates leading up to the December 19decision7, and hit contrasting choice of words within a one-month period. On November 28, Powell said in a speech that interest rates are “just below the broad range of estimates of the level that would be neutral for the economy — that is, neither speeding up nor slowing down growth.” This statement was in stark contrast to a comment Powell made on October 3, saying that interest rates were “a long way” from neutral, which sparked fears that the Fed was increasingly hawkish. Consumer confidence peaked in Q4, with the Conference Board’s monthly consumer confidence index registering readings of 137.9, 136.4, and 128.1 for October, November and December, respectively8. The October reading of 137.9 represented an 18-year high in consumer confidence. Despite the sharp drop in December’s reading, the holiday shopping season was the strongest in six years, with retail sales increasing 5.1% to more than $850 billion between November 1 – December 249. The Institute for Supply Management’s factory sector and service sector purchasing manager indices ended 2018 on a sour note, with a sharp decline registered in December. ISM’s service sector index registered October, November, and December readings of 57.7, 59.3, and 54.1, respectively10. A reading above 50 indicates expansion in the sector. The 5.2 point drop in December has investors on edge because of the two times the ISM index dropped by more than 5 points this century; both occurred during recessions (2001 and 2008). The unemployment rate held steady at 3.7% for the months of October and November, but rose to 3.9% in December. Average hourly earnings, a closely watched sign of whether inflation pressures are building, again rose at a 3.1 percent pace from a year ago. The U-6 rate, encompassing underemployed workers, rose from 7.4% in October to 7.6% in November. October brought 250,000 net new jobs to the economy, and the Department of Labor said that 155,000 more were created in November11. Nonfarm payrolls surged 312k in December, beating even the most optimistic market forecasts by a wide margin (consensus median: 184k; maximum: 225k). The prior two months were also revised up 58k on net. The robust gain in payrolls was largely driven by the rebound in the service sector back to trend, thanks to a strong holiday shopping season. Recent data on consumer spending indicate considerable vigor in underlying demand. The Federal Reserve Bank of Atlanta’s GDPNow model estimated 2.6% Gross Domestic Product (GDP) for Q2. The estimate was as high as 3.0% on December 19following the release of initial home sales data. China continues to cope with a deceleration in economic growth amid the fallout of dealing with U.S. tariffs. Results of a private manufacturing survey for the month of December showed Chinese factory activity contracted for the first time in 19 months. The Caixin/Markit Manufacturing Purchasing Managers’ index (PMI) fell to 49.7 in December from 50.2 in November12. A reading above 50 indicates expansions, while a reading below 50 indicates contraction. Several U.S. multinational companies, most notably Apple, have warned that business in China has deteriorated materially in Q4, suggesting that the economic slowdown in China may not be over yet. Europe also posted a challenging Q4, with reduced economic growth forecasts and an end to the three-year quantitative easing program run by the European Central Bank (ECB). The ECB’s $3 trillion bond buying program has ended, and the central bank claimed it is still on track to raise interest rates after the summer of 2019. ECB President Mario Draghi said 2018 growth in the euro area was expected to be 1.9%, down from a prior forecast of 2.0% in September13. The 2019 GDP forecast was also trimmed to 1.7% from an earlier forecast of 1.8%. Given that the EU is China’s largest trading partner, it comes as no surprise to see economic weakness in both areas at the same time. Political uncertainty remains in the U.K. with regards to Brexit. Prime Minister Theresa May survived a vote of confidence in December14, but she has yet been able to unite the fractured parliament to agree to a Brexit deal with the E.U. There is no telling whether the agreed-upon deal will be a hard or soft exit from the E.U., and that uncertainty is weighing on business and consumer confidence. House prices and the number of sales transactions have also been impacted by the Brexit uncertainty, which has lead the Bank of England to keep rates steady at 0.75%15. The MSCI Emerging Markets fell 7.47% during the quarter, and finished the year down -14.53%. The MSCI All Country World index lost 12.75% in three months and returned -9.38% for the year. Oversupply concerns caused WTI crude to fall 39.12% in the fourth quarter. Brent crude fell 38.86% in the quarter as well. Gold finished the quarter up 7.11%, and finished the year down -2.13%. The housing market continues to be strained by increasing mortgage rates, increasing labor and input costs, and land shortages, leading to tight inventory. While existing home sales recorded a slight gain in Q4, they also experienced the sharpest annual drop in more than seven years. The National Association of Realtors said existing home sales increased 1.9% to an annual rate of 5.32 million units in November16. The month of October saw sales of 5.22 million units, representing growth of 1.6%. Sales have increased for two straight months. The average 30-year Fixed Rate Mortgage (FRM) hit a seven year high in November, coming in at 4.94%, according to FreddieMac17. However, a sharp decline in interest rates in Q4 led to a 4.63% reading for the average 30-year FRM in December. Average interest rates for 15-year FRMs and 5/1-year ARMs were respectively 4.33% and 4.14% back on November 8; they stood at 4.07% and 4.04% on December 14. The fourth quarter reminded investors of the inherent risks associated with investing: losing money in the stock market and finding little refuge in the bond market. 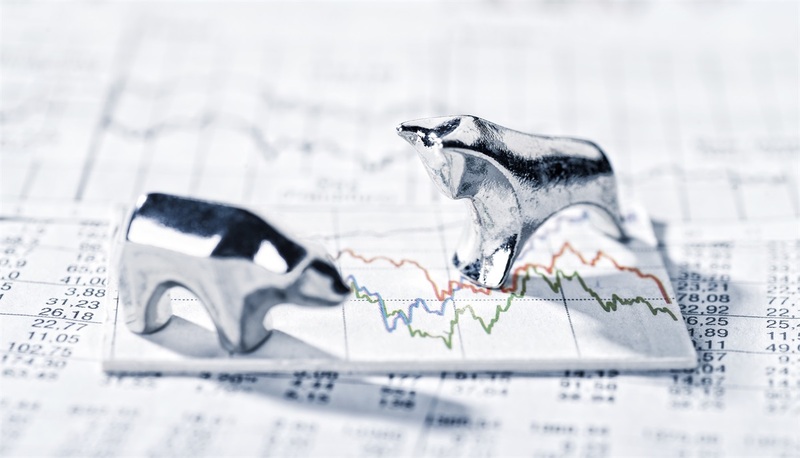 A combination of concerns including slowing global growth, escalated trade tensions, and uncertainty in Washington D.C. led to a peak to trough drawdown of 20% for some indexes, the very definition of a bear market. Given that the current economic expansion cycle is in its tenth year, investors are anxiously waiting to see whether a recession is in the cards for 2019, or if the recent sell off is similar to the 2016 hiccup that will ultimately resolve to the upside. Investors holding out for the latter will be looking to see if in 2019: China and the U.S. resolve their trade disputes; the U.K. avoids a hard-no Brexit; and more dovish action is seen from central banks around the world. On the flipside, a sustained slowdown in the global economy, a hawkish Fed, or an escalation of the trade war between China and the U.S. could dampen sentiment and threaten this 10-year equity bull market. The US dollar's direction may help frame the case for U.S. stocks vs. international equities in coming months. Dollar strength, held up in 2018 by rising trade tension, hawkish monetary policy, and Brexit/ Italexit, may begin to slow amid concerns surrounding Europe. Moreover, EM currency struggles have begun to ease in recent months, as evidenced by the rally in Bloomberg's Cumulative FX Carry Trade Index since the end of 3Q2018. A trade truce between the U.S. and China, and less-hawkish Fed policy, could further ease the pressure on those currencies. The dollar and U.S. equities' outperformance go hand-in-hand. The past year is no exception to the rule, with dollar strength indicative of large capital flows into the U.S. Better relative performance vs. international stocks will start to fade going forward, if the dollar shows true signs of weakness. The headline December ISM manufacturing index dropped to its lowest level (54.1 vs. 59.3 prior) since November of 2016. The decline, the most severe since October of 2008, was sharper than consensus expectations, which called for 57.5, and was below even the most pessimistic estimate (55.0). While the decrease is a sign that conditions in the sector are cooling, in-line with a moderating economy, consensus expectation for the index is to remain in expansionary territory (above 50.0). The sharp decline in the headline ISM manufacturing index in December signals that conditions in the manufacturing sector cooled at year-end. While there could be a rebound in the near term if a trade deal is reached between China and the U.S., the underlying moderation in economic activity projected for 2019 is likely. After months of having only a minimal impact on the sector, trade tensions appear to be finally weighing meaningfully on demand for manufactured goods. The comments section of the ISM’s December release focused on the impact from tariffs and general uncertainty on trade policy, noting that supply chains were being materially affected. The Trump administration delayed a significant increase in hostilities with China until March 1 in an attempt to negotiate a larger package, but the outcome of discussions with China remains uncertain. Business sentiment among manufacturers will dip further if a better deal appears unlikely as the deadline approaches, even if the can is kicked further down the road. The latest ISM release dampens the notion that investment spending will compensate for an anticipated cooling in consumer spending this year. To be sure, it’s still early days in 2019, and some clarity on trade and political developments could provide support to demand. However, the recent sharp declines in regional Fed surveys, and drop in some global manufacturing indexes, suggest that the sputtering in the manufacturing sector is broad-based and representative of underlying economic forces. After more than 1,600 bps of outperformance in 2018, U.S. stocks could take a backseat to their global counterparts next year. Ironically, U.S. policymakers could offer the support that international stocks need to best their U.S. counterparts in 2019. This support could come in the way of hawkish monetary and restrictive trade policies, which aided capital flight to the U.S. in 2018, yet that may reverse as these policies ease, thereby limiting future performance for domestic shares. The U.S. has experienced five straight months of net positive capital flows, which ended in August, including two of the largest months within the current cycle. There's little to suggest the longer-term trend of U.S. outperformance is coming to a close, however, 2019 may be another year for the U.S. to pause and refresh if global risk appetite improves. Quantitative tightening (i.e. the shrinking of the Fed's balance sheet) is taking an increasing toll on the relative valuation of levered companies versus less indebted peers. Since 2011, based on total debt-to-asset ratios, the top quintile of companies (the most highly levered) steadily gained a valuation premium vs. the less-levered or unlevered bottom fifth. Relative price-to-book ratios for the two security groups reached a spread of about 2 times by early 2016 and remained at that level until late 2017, the point at which the central bank began running off its balance sheet. S&P 500 debt, just 25% of total assets, is well beneath the pre-financial-crisis average of 37%. That said, nonfinancial sectors have the highest debt-to-asset ratio since 2003. S&P 500 nonfinancial debt is 31% of assets, which is above the 2009 peak. Debt-to-asset ratios for all sectors (except financials and industrials) are also above their financial-crisis peak. Increases to debt-to-asset ratios have been particularly rapid for discretionary, health care and technology in the current cycle. Financials have the lowest ratio among sectors, partly due to the carve-out of real estate (which has the highest debt-to-asset ratio). Investors today are more focused on the shape of the Yield Curve, which has been flattening progressively. For the first time since the financial crisis, the Treasury curve between 3-year & 5-year and between 2-year & 5-year yields inverted yesterday, falling below the zero line. The 2-year & 10-year yield curve is very close to inverting, which is seen as a reliable leading indicator/ predictor of economic recessions (usually by 12-18 months). The red bars represent the U.S. recessionary periods, which have consistently followed yield curve inversions. If history is any guide, and the 2 & 10-year yield curve indeed inverts within the next few weeks, we could still be approximately a year away from the next economic recession. Investors are also well aware that significant market downturns typically precede recessions by about eight months. At Tompkins Financial Advisors, we closely follow the relationship between the 50-DMA and 200-DMA. The intersection of these two moving averages is commonly referred to as either a Golden Cross (bullish signal) when the 50-DMA passes above the 200-DMA, or a Death Cross (bearish signal) when the 50-DMA passed beneath the 200-DMA. Although the industry terms surrounding these indicators may seem dramatic, their use is widespread and accepted by market participants throughout the world. 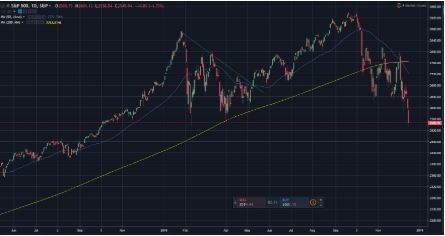 Since the last Golden-cross took place on April 21, 2016, the two moving averages finally intersected on December 7, 2018 yielding the much anticipated “Death Cross,” or bearish technical signal. Given the crucial technical levels that have been breached, the IC is currently considering taking further defensive positioning as we enter the new year.